“My husband passed away in June 2013. We had separated six months previously. On the day I was informed of his death, I was in my garden with a workman. I was shocked and extremely upset and was concerned about my children receiving the news. The workman was asked to stay with me whilst someone went to collect my daughter from work. As I was crying, my phone started to ring. It was in my back pocket, and I was too upset to answer, but it would not stop ringing. I then thought it might be the police as they had found my husband’s body. However, my phone showed my husband as the caller, which upset me even more. Crying, I showed the workman my phone, explaining it was coming from my husband’s phone. We were totally baffled. I eventually answered as I thought it might be the police calling. I only heard static. Want more? Check out Phone Calls from the Dead, a book chronicling the result of a two-year investigation into the phantom phone call mystery. I got a phone call from a dead friend. The phone rang (don't know if it "really" rang as I had been asleep. As I woke up I heard my friend on the line and I said something like, "Elizabeth it's you...how can it be you?" And SHE SAID: "I don't have time for that - check on my kids!" And that was all there was. I did check on her children and there were problems with where they were staying and so I called their father and talked to him and he went and became more active in their lives. I saw them one more time - he and they and I had lunch and I noticed that her younger hyperactive child was actually calmer and behaving better without being told. I knew they were OK then. More Phone Calls from the Dead? Phone calls from the dead are a common theme in books and film. However, can the dead truly use phones to reach the realm of the living? Here are three creepy tales that might make you think. On September 12, 2008, two trains collided in the Chatsworth district of Los Angeles, killing 25 people and injuring countless others. One of the victims was a man named Charles E. Peck who was traveling to L.A. to interview for a job. During the first eleven hours after the crash, Peck’s fiancée and several of his family members received numerous calls from his cell phone. All in all, Charles’s loved ones – which included his son, brother, stepmother, and, sister – received a total of 35 calls. Each time family members answered a call, however, they heard only static, and calls to Peck’s phone went straight to voice mail. Naturally, the family hoped Charles was alive in the wreckage and reaching out for help. Twelve hours after the accident, rescuers traced the signal from Peck’s phone and discovered his body in the lead passenger car, where most of the serious injuries and deaths occurred. Authorities reported that Peck’s body “showed no sign that he lived even for a short time after the crash” and that he couldn’t have possibly made the calls. Adding to the mystery, rescuers never found his phone. In 2003, Lancashire resident Frank Jones lost his wife, Sadie, to a heart attack. Sadie loved her cell phone, so Frank buried his wife with her cherished device. Soon after Sadie’s death, however, Jones and his family began to receive strange calls and SMS messages which they believed came from her phone. Family members also received messages written in Sadie’s style, but there was no phone number attached. The mysterious phone activity wasn’t the Jones first brush with the paranormal. In 1996, Frank had his home exorcised after a malicious entity he called “The Thing” terrorized his family by pulling on bed covers and banging on walls. Earlier this year, talk show host Katie Couric reported that a land line registered to her dead husband had started dialing 911 every Tuesday at 2 a.m. Police responded to Couric’s residence at least 10 times, and a frightened Katie contacted NYPD chief Ray Kelly for help. Police investigated the incident and named bad wiring as a cause, though some find the explanation unconvincing. Katie’s late husband Jay Monahan died of colon cancer in 1998. “A good friend of mine passed away on Monday, October 31, 2016. He worked at my gym, so I went there the next day to stretch and exercise, as well as mourn his loss. That day at the gym, I received two phone calls a few minutes apart. They were from an unknown caller, and I heard only two beeping sounds. My mom, who is very superstitious, mentioned that I should watch for signs of contact from my friend. I thought this was silly, but still could not help wondering if the calls were some sort of attempt to contact me. I went to the gym again the next day. This time, there was a small table set up with flowers and a photo of my friend. His girlfriend was also there that day. Again, I received the same call from an unknown caller with the same two beeps. I felt silly, but for fun I decided to say, ‘Cool, I hear you.’ and hang up. A few minutes later, I received another call from the unknown caller and heard a beep. Feeling silly, I said, ‘Is that you?’ Immediately after I said this, I heard three or four more urgent and unrhythmic beeps. Again, feeling silly, I said, ‘Are you trying to tell me something?’ This was followed by a few more urgent and unrhythmic beeps. This is one of the "neater" stories I have ever read. It makes one wonder if there IS a "window" shortly after a death where the recently deceased can communicate with the living. Why do they have to be recently deceased? Ghosts can contact people at any time. Maybe after a while people just forget about them. Bottom line, we can't "wish" this type of thing (like a curse) on anyone ELSE. Everyone is responsible for their own desires/wishes. Which MIGHT be WHY we ARE NOT supposed to contact the dead.... could be very much against THAT dead persons main wishes of "to not be bothered in the after-life"
i.e. : WHERE does the "rule" of "3 wishes" originate from?? Are there times in the after-life where you are "cognizant " that you have made a "poor choice" for Eternity, and you can change your mind?? Believing in Jesus as Christ, can we ASSUME that He "settled" emotional issues with people he brought "back from the dead", such as His good friend Lazurus? (Who possibly saw Heaven, and previously deceased family/friends, and really didn't want to be revived. Lol). Or were people like Lazurus and the very sick little girl just revived from some sort of "sleeping", and just thought that they woke up? Even if someone had the onset of rigors, Jesus could heal anything! How could we ?forget? ? History is fraught with tales of "ghostly beings"
“My father passed away of cancer when I was 15 years old. He had been sick for a long time, going through periods of getting better and then worse again. He was an engineer and a tech geek, and had installed an internal phone network in our three-story house – each of the rooms had a telephone, and we could call each other as well as make outside calls. The internal and external ring tones were different. Two or three months after my dad passed away, I was home alone doing laundry. The clothes dryer was in our basement, right by my dad’s old room, or man cave. As I was standing there, the phone in his room started ringing with the ringtone for internal calls. I didn’t feel threatened in any way, just surprised, so I walked over and picked up. There was nobody on the line, just silence. When I went upstairs, I saw that the handheld telephone on the first floor was picked up. When my mom came home, I told her about what had happened. She looked at me and said ‘Oh no, don’t tell me it happened again!’ She then told me that the same thing had happened to her a few weeks prior. I never heard anything again, but I’m certain it was my dad. The phone had some significance, because on the day he passed away, phone records show he had tried calling my mom over and over from the hospital but could not get through to her for some reason. By the time the hospital called, he had lost consciousness, so she never got to talk to him again. I like to believe that he was trying to tell us that was okay, especially since I never felt threatened in any way. Here's a thought or two that I have about this (also some intuitive bits). To communicate with anyone, dead or alive one needs two things: Someone who has something to say. Someone is willing to listen. When its two people in their everyday reality, one picks up the phone and talks or texts. The other is alerted, picks up the phone and listens or watches. And maybe responds. We do not (mostly, the exception being a few people here) expect to or WANT TO communicate with the dead. Or recently deceased. Dreaming seems a little more socially acceptable - a psychologist can blow that off as wish fulfillment. SAYING that one was phoned by the dead, that one HEARD A MESSAGE, puts one in a catagory of hypnogogic hallucination or delusion or worse. We all know its not that safe outside the box. So we resist hearing, if there is anything to hear. Subtlety will not work in the favor of someone "on the other side" wanting to say at last: I really loved you. I'm sorry I had to leave. (And in the case of the dead man on the train) here is my body for you to mourn and put to rest. So the dead now phone. Oh course, everyone has their cell phone with them everywhere. Maybe even in death. People used to be contacted by bells and knocks and such (limited resources and unfortunately easily faked). Then some saw things in the snow of a TV off channel - the black and white ones produced a hypnotic snow not unlike looking at falling snow. Trance is very useful in sneaking pasts one's conscious reality enforcers. When I got my phonecall - there were urgency on the end of the line. My friend seemed aware that she had moments not minutes with me. Happily she didn't have to convince me that I needed to follow up her concerns. And they were WARRANTED. Her youngest son was being programmed by her oldest son's fundamentalist Christian wife. He had seizures. She told him it was Devil in him - it was because he had been bad and let his pet bird die. He was 8. I heard all this firsthand from his older brother 13, and took the information to their father who stepped up to help raise them. I knew that the message had been accurate and how concerned my friend (a wonderful mother) was at the new developments going down. She had been so happy that she had arranged that her oldest and his new wife move in and that her younger boys could stay home (even though she wasn't there). So. A need to communicate. A person willing and able to listen. Just that Casper and everyone else here who is seeking contact or confirmation. I have had people die since and I was not on their speed dial list. I got nothing. I heard later than they had died. I would restate something I heard a psychic say: People really only have two questions of the dead. "Did they love me? Did they know I loved them?" Nothing else is very important at the end. Claudia Cunningham is someone who has very generously shared with me several accounts of strange and supernatural experiences that directly involved her. Claudia tells us: “In the late ‘70s I was married and my husband was a police officer who worked nights. 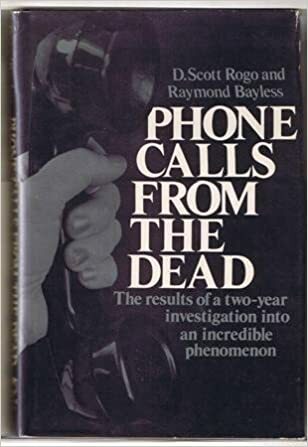 Being alone and bored a lot I was heavily into reading of the paranormal through my massive little library – and I was then reading Phone Calls from the Dead by Scott Rogo [and Raymond Bayless]. The gist was that when someone died they could call you and the book gave many instances of this happening. One famous person it happened to was the late actress Ida Lupino. Her father, London stage actor Stanley, supposedly called her from beyond the grave. It was eerie reading, believe me. “One night I was in bed reading the book and I snapped on the AM radio on my night table, and the show was WGY’s talk show and they were interviewing UFO abductee Betty Hill. She said she had a lot of phone interference after seeing the UFO with her husband Barney…static, that sort of thing. I was very nervous that night listening to it and imagining my phone would ring. Imagine my shock when it DID ring. This must have been around 9 PM at night…and all I could hear was static!! Like I say, I was heavily into reading anything about UFOs, Bermuda Triangle, etc. and I think my fear triggered the call. I mean, I think fear attracts these entities and they were having, as John Lennon would say, ‘a larf’ on yours truly. “Second incident…I was a gal who liked to go out on weekends as anyone would in their early 20s. I was dating Denny Cunningham, who I would later marry. Denny worked at the Postal Service before getting on the Albany, NY Police department and he worked nights. I would drive in from my parents’ home in Glenmont to Albany and meet him, just usually for a chat and to watch Johnny Carson’s Tonight Show together at his parents’ home. On Fridays and Saturdays my parents would go out to meet another couple for dinner and drinks and not return until sometimes 2-3 AM. Now, when you leave Albany en-route to my house you go down what used to be a very rural road (now it’s all built up, but in the late 60s it was very desolate). You had to pass a huge Catholic cemetery and when you pulled in my driveway there was and is a field with high weeds. I always imagined that someone could be waiting for me and do something awful. I’ve always had a very vivid imagination! “I did have an incident where a man followed me home one night and pulled a pen knife out of his pocket after I pulled in the driveway. He was trying to run me off the road…it was terrifying. This happened after the incident I will now tell you about. But to return to the subject at hand, between the fear of breaking down in front of the cemetery and the field next to the house, I was always very nervous. I ran into the house, dreading the fact that it would be dark and I’d be alone. No one was home but “us chickens” as my grandmother used to say. I immediately turned on a light on the mantel and retired to my bedroom, heart beating heavily, to await my parents’ return. I no sooner got to my bedroom than my brand new pink rotary phone with a PRIVATE UNLISTED number I had just gotten, (free as it happens, compliments of my employer, NY Telephone Co.) rung! Denny never called me that late. He never called to see if I made it home or anything. Three people had the number – Dennis, his sister and my friend, Ann. I had just gotten the phone. No one had my number, OK? “A man with a guttural and threatening voice said very emphatically, ‘Claudia? I see you just got home. Do you know KNOW what I’m going to do with you? I’m coming over now’…and hung up!!!!!!! I thought I would absolutely die on the spot. Just think, now…a brand new phone with a brand new number… no one had it. If a neighbor saw me pull in they wouldn’t have my phone number to call me, so it was no neighbor. I heard a car pull in the driveway as I was planning to run out through the cellar through the cellar door to escape…and it was my parents! Thank the Good Lord. I never found out who it was, nor do I want to know. I was involved in my studying UFOs, etc. and I was always very nervous and upset around that time to begin with. As many young girls know, and especially in that time, it was very important to get married. Denny was kind of balking, and I was miserable. Besides, I hated my job…so I was nervous all the time and emotional. Again, my private fears and my interest in strange subjects must have pulled some entity to me just to frighten me. Well, whoever it was succeeded beyond their wildest dreams. “When cell phones first started to get popular my mom bought me, my sis and herself all a new cell phone...on the condition that if she called that we always answer no matter what. No excuses. Every time. One night I was walking up my long country driveway after we had a big snowstorm. I had a 2wd car and couldn’t make it up so I would park at the bottom. I started walking and my phone went off. It was a text from my mom, but there was no message. Just a blank screen. As I was holding it the phone went off again and again and again. One after another. About 10 times. All text messages from my mom with no message. Just blank. I was thinking what the hell is this. Then my phone rang right when I was at the door. It was my mom. I said hello and the first thing she said was, 'I have been texting you why didn’t you respond? Where are you? What are you doing?' I said, 'Mom I am literally walking in the door right now.' Which I was. Most nights my mom slept on the couch because my dad is a crazy dreamer. He would kick and punch my mom in his sleep. The couch was perfectly visible from the front door when you walked inside my house. Anyways all the lights were off in my house as I walked in. I was just telling my mom I was walking in the door she said she really needed to talk to me when I got inside. To come talk to her. I was kicking off my shoes at that point and I couldn't see anything. I said, 'Ok' and my mom said, 'I love you.' I said, 'I love you too' the moment I was flipping the light switch to the walk in light inside my house where everyone took off their shoes. I was literally looking at my mom fast asleep snoring on the couch as I was saying, 'I... love.. you... Too.' Then I was looking at my mom sleeping as I heard the phone click from the caller on the other end hanging up. It couldn’t have been my mom. I was so confused and scared and just in shock. My brain could not compute what happened. As I was standing there shaking and trying to grasp what happened I could hear my mom moaning in her sleep. She was obviously having a bad dream. A nightmare. I turned on the living room light and I shook my mom awake. She flew up into a sitting position in a panic. Tears in her eyes. She was in full mom panic mode. She said she was having the worse dream that I had been killed in a car crash. She explained how she was desperately trying to call me and text me in her dream, but she couldn’t dial the numbers right. No matter how hard she tried to open up a line of communication with me she couldn’t get her cellphone to work right. Which I have had the same kind of nightmare myself. Udder frustration and panic. As she told me about her dream I must have turned white from pure shock and confusion. She noticed and asked me what was wrong with me. I told her what happened. How she had texted me a bunch of times with blank messages back to back 10 times and I also told her about the phone call. I told her exactly what happened.